i decided to change up my studio in art sculpture project this year, forgoing my typical frank gehry-inspired abstract sculptures in favor of animal-themed sculptures based on the work of aj fosik. 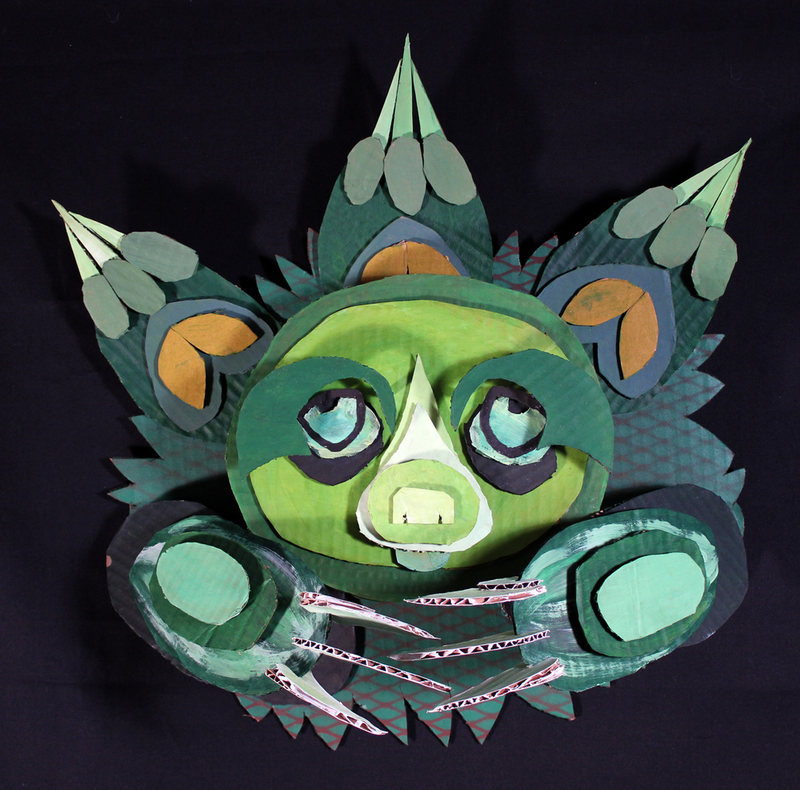 we used cardboard, acrylic paint and spray paint - putting an emphasis on animal likeness and exaggeration of features. i am extremely happy with how they turned out! thinking more about the work that has inspired me over time, and most directly inspired my recent body of work, i keep coming back to augustine kofie, aka KOFIE ONE. 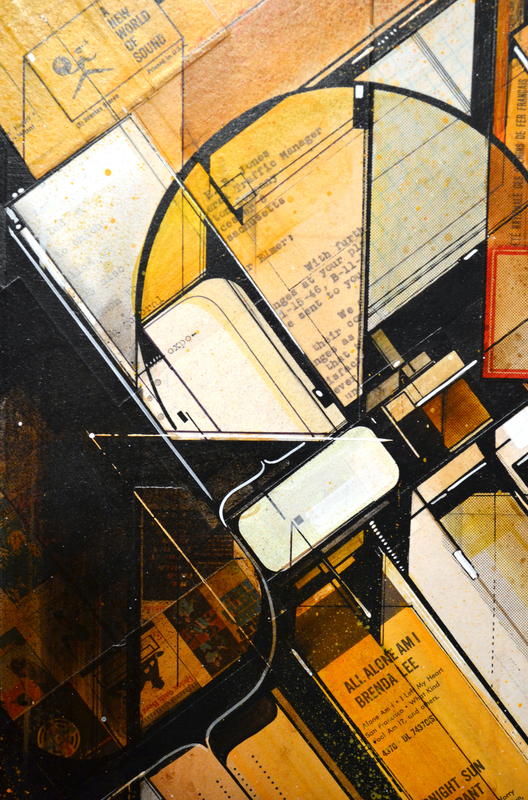 kofie's work blends interesting geometry, bold colors, lots of graffiti-inspired texture as well as a clean-cut graphic quality (including collaged elements) that really appeals to me. 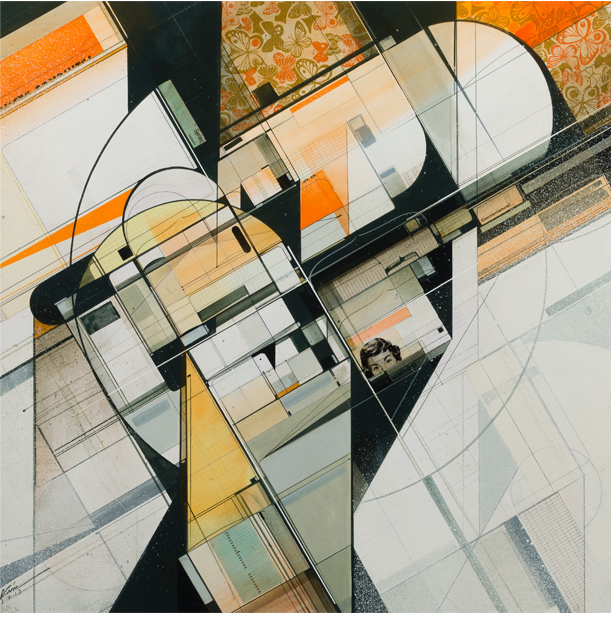 his use of mixed media (cut wood, yard sticks, found objects) also adds another interesting dimension to his abstract compositions. new painting // "always there"
over spring break, i completed this new painting entitled "always there". i used an old cigar box that i purchased at an antique shop last summer, allowing some of the elements from the box to show through and interact with the bold geometric patterned elements in the painting. it asking to be explored. on my journey through art-making, i have always found inspiration from the artists of the second half of the 20th century. but recently those inspirations have taken on a new importance for me as i have begun a new series of work that i can "excavations", where i am creating narratives through combining text, numbers, patterns and portraits. i am layering these things together on surfaces that are pieced together from scraps/recycled pieces of wood, aiming to create pieces that look as though they could have been excavated from within a wall of an old house or pieced together from pre-painted remnants of america in the 1950s. 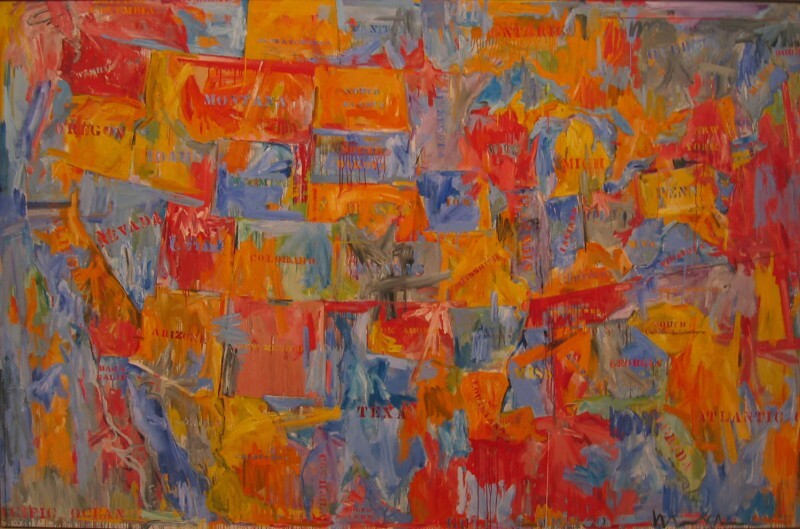 i have always drawn upon the work of jasper johns - but his painterly brushwork and use of symbols and numbers has taken on greater importance here. richard diebenkorn is an artist that i was introduced to by my mentor and friend, bill stephens. he goes to diebenkorn's work for inspiration, and i have come to be influenced by his color fields and color/tone relationships and geometric division of space. his 'ocean park' series is specifically inspiring to me. 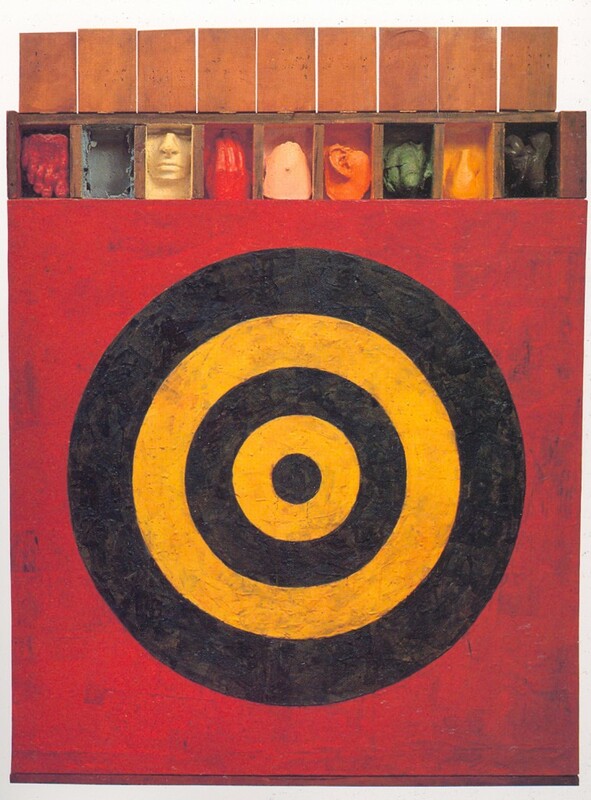 you will find a wide variety of pop-culture imagery weaving through robert rauschenberg's works, but what i have always been most drawn to are his 'combines' - paintings that have actual objects attached to them. along with being beautiful (or ugly... but in a beautiful way), they begin to weave a story once they are combined with the imagery and colors that he applies. hopefully as you view these works and dig a bit deeper into the artists, you can see how they have inspired me - and i hope that you come to have your own group of inspirational artists along your artistic journeys. ethan murrow is creating grandiose theatrical narratives using only graphite pencils! these pieces range in size from 24"-48" and weave surreal fantasy into vintage american scenes and settings. Winston Wachter gallery calls these “characters as outrageous innovators and absurd explorers capturing a sense of adventure, satire, fun and defeat.” can you imaging doing a pencil drawing this large and this detailed? 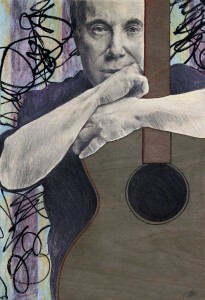 so, i realize that its been far too long since i have posted anything about my new artist obsessions. i end up using pinterest as my main place for sharing my artistic inspiration (and most of my student artwork ends up on twitter)... BUT this needs to change. and aj fosik is the reason. 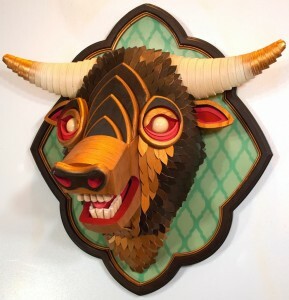 he did the sculpture that can be found on the cover of mastodon's 2011 record "the hunter", and from that moment on i loved his work. recently i was brainstorming with my good friend rob and he reminded me about fosik's work and it got me thinking about how i could use it with my students. 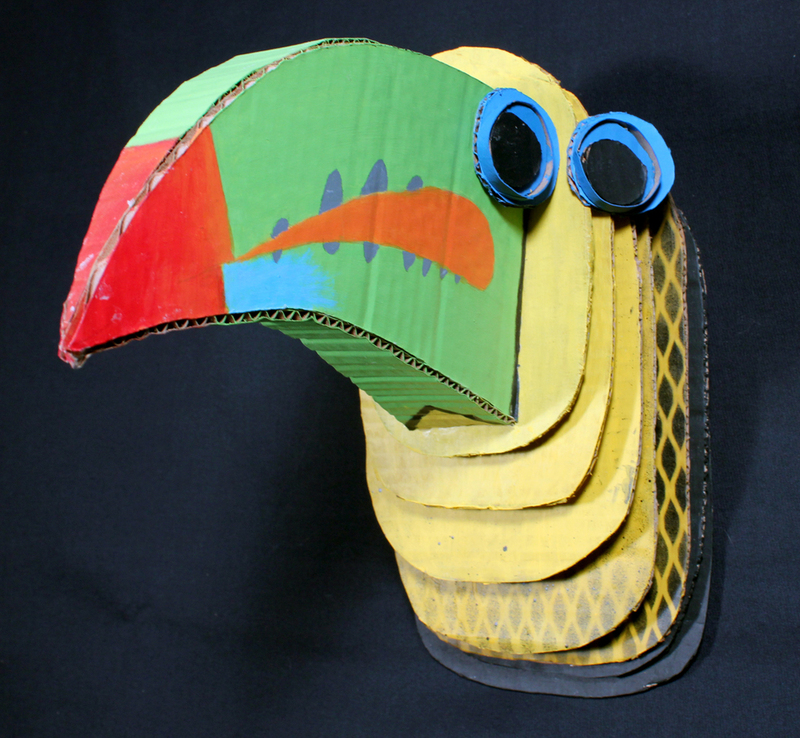 my studio art class will be creating animal bust sculptures (using cardboard) with an emphasis on color and pattern. 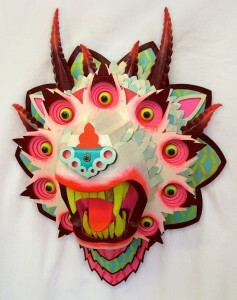 i love how fosik's work shows his crazy diverse interest in folk art, psychedelic art... and taxidermy - in such an interesting and unique way. check out 2 quick videos and some of my favorite works of his below. the artroom is now on twitter! check out @titanART57 if you're interested in following everything thats happening in my classroom throughout the year. in a fun and meaningful way. somehow i forgot to post this a few weeks ago when i finished it... oh maybe its because i finished it the day that i hung my show, then had the end of the school year to deal with. so, happy summer, here's "a window in your heart" (paul simon)... my latest collaboration with my son (he did the background). kelly hurlburt is a student in my AP Drawing class this year - and i have been lucky enough to teach her since she started at thomas as a freshman. on top of being an awesome kid and artist, she is helping out this year in my studio in art class as a teaching assistant (and you've seen their colored pencil works in my last post). needless to say, we spend a lot of time together! 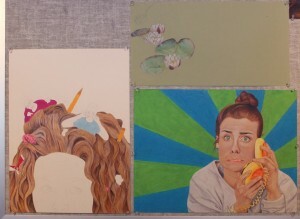 the AP Art curriculum mandates that each student choose a 'concentration' theme for 12 of their 24 portfolio works. in her words, kelly's theme deals with the juxtaposition of scenes from everyday life with scenes of disaster and suffering. these somewhat whimsical combinations are meant as sybolizations of apathy. in other words, the pieces comment on how people do not care about tragic events that are going on in the world if they do not directly affect them. 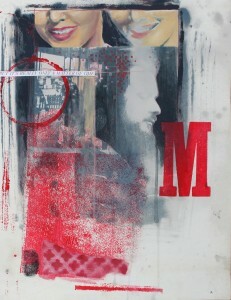 everyone that sees her work finds in not only visually arresting, but also thought-provoking and mature. it is definitely one of the most creative 'concentration' themes that i have seen in my 9 years (nine years!!!) of teaching AP. take a few minutes and look at kelly's work (you can click on the images to enlarge them) - consider how we all take these issues for granted as we rush through our daily lives. art room progress... and studio in art awesomeness. drawing 1 is starting their digital painting self portraits, AP continues on with their 'concentration theme' work, and drawing 2 and studio in art are continuing with their still lives. i continue to be impressed with the work that all of my students are doing - and today my (mostly freshman) studio class' progress and overall awesomeness compelled me to share with you all. 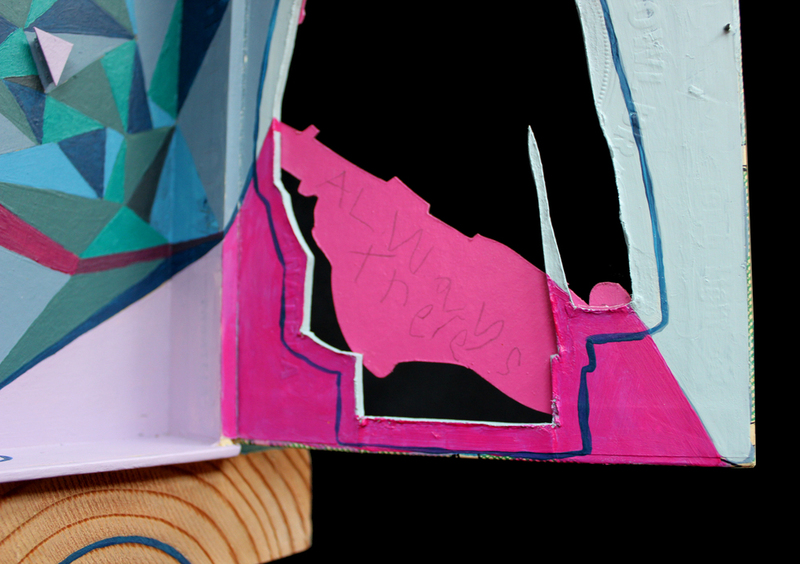 i am lucky to have my students' work featured in 2 exhibits right now. the first is at the rochester arts and cultural council, in honor of youth art month. the show is composed of works from 3 awesome local high schools, and was conceived of by west irondequoit superintendent jeff crane and curated by IHS teacher and art coordinator sue jacobs. IHS and penfield high school join the webster high schools in this beautiful show, which takes place in the most professional gallery setting that we've shown in. it is in fact the first time that high school student work has been featured in this particular gallery - and i think we are setting a high bar. there will be a closing reception on march 23rd that will be open to the public, and will have the same selection of great food (and great artwork) as the opening reception. 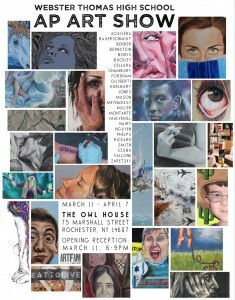 also, my AP art class will be having our annual exhibition at The Owl House, opening next monday, march 11 from 6-9pm. the kitchen will be closed for dinner so we'll have the restaurant to ourselves as we transform it into a gallery. there will be free snacks and the bar will be open. this reception is free and open to the public - we would love to have you all join us! if you would rather go and enjoy a fantastic meal while surrounded by the great artwork, the show will be up until april 7, and the restaurant is open tuesday-sunday each week! during 6th period today, an awesome thing happened; i had a free period (and i was grading... blech), and like many free periods, the room was occupied by students working on their art pieces. but what was different today was that the tables were full of a variety of students from each grade and all of my classes, sitting intermingled, working intently together. there was such a wonderful energy in the room, i had to capture it. this series of paintings, entitled "4x34", are all done by my 4 year old son and myself. he was inspired by watching herakut paint the mural in rochester in october, and had been talking about wanting to do some 'murals' of his own. we used latex paint, spray paint, and paint markers on stretched canvases. it was a very organic process where he would start by picking the color of paint and rolling it on the canvas (or conversely he would choose the spray paint color and i would apply it, then he'd paint over it). he would really lead all the work, and i would be there to just redirect when necessary or have him stop and start something new when the time was right. he would draw lines - sometimes representing a 'thunder storm' or 'the ocean' - and i would add to them, making them fit together or blend more seamlessly into the composition. his energy and natural markings were a wonderful juxtaposition with my control and knowledge of composition. it was very eye opening for me as an artist, as well as a great way to spend time together. i started this last week as an idea for a drawing 1 project, but it became something that i would actually consider a finished work. it is made using india ink washes, pitt artist pens and prismacolor colored pencils. on friday, i completed this painting of son house, "the beginning and end of all music"
it is acrylic, latex and spray paint on various wood blocks. you can see it on display at RIT during february. so much color in the art room. its always hectic coming back from christmas break, but the following week ends up being a bit more normal and we can get back into our groove. i took a period and put up all the in progress works today and was amazed to see all the vibrant yet subtly layered and placed color together from DRAWING 1 (descriptive self portraits), DRAWING 2 (abstracted still lives), and AP DRAWING (personal theme work). so much great work all in once place. 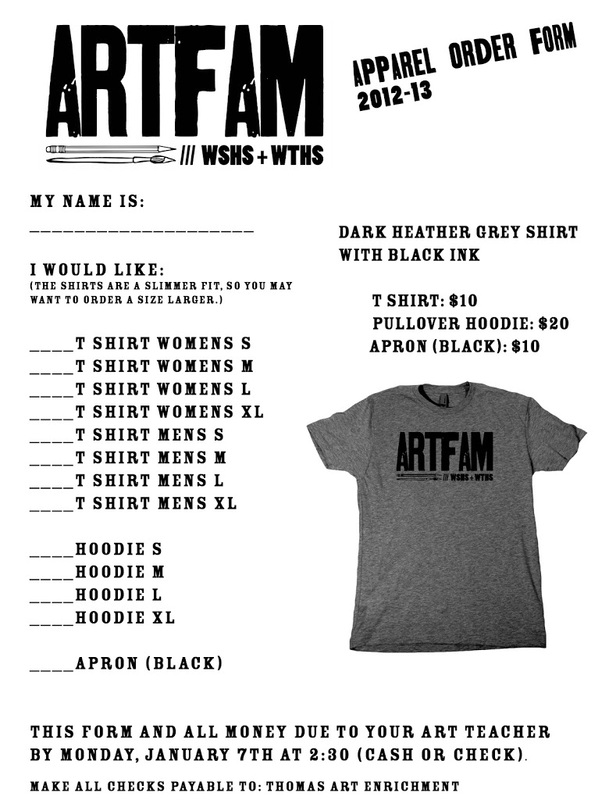 heres the order form for the 2012-13 thomas/schroeder ARTFAM shirts. if you are interested in one, let me know! annual tshirt screen printing fundraiser! please join us once again for our annual screen printing fundraiser this coming tuesday. you bring in a shirt and $5, and you can pick any of the 5 designs to be printed on the shirt. all proceeds to go help in the relief efforts for hurricane sandy.